This is the second post in a little series of commonly confusing drugs in the retail pharmacy setting. The first post was on the often confusing generic versions of Depakote and Depakote ER. 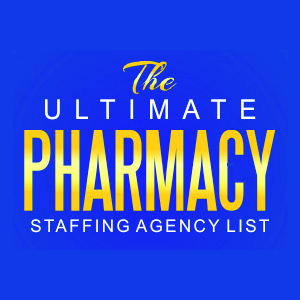 In this post I would like to clear up a little confusion that virtually every new pharmacy technician and pharmacy intern confronts: BUPROPION! I know what many technicians think when they see a prescription for Bupropion pop up on the screen. “Ugghh, not that drug! Which one should I pick this time?” The frustration is almost enough to want to make you reach for its next door neighbor, buspirone (for anxiety), but that is a topic for another post. The problem with bupropion is that it seems like there are so many different forms and strengths and versions, and sometimes the same strength in different time-released formulations, that it can be hard to keep them all straight. The confusion is only made worse when you walk into some pharmacies and see the bottles of bupropion all scrambled around on the shelf in no particular order. But actually we can clear up the confusion without too much difficulty and hopefully put your worries to ease once and for all. As with the previous article, the best way to clear the confusion is to start with a little discussion about the BRAND names for which bupropion is the generic. 1. Wellbutrin (bupropion): Wellbutrin was initially approved for use in the U.S. for the treatment of depression back in 1985. Unfortunately it was discovered that it caused seizures even when used at recommended dosages and was promptly withdrawn. It was reintroduced into the market in 1989 at a lower recommended dose (not to exceed 450mg/day). Important to this discussion: This is considered an immediate release product and is available in 75mg and 100mg tablets and is dosed 3-4 times daily. 2. Wellbutrin SR (bupropion SR): Taking anything 3-4 times daily is inconvenient. So the manufacturer developed a TWICE daily version of Wellbutrin called Wellbutrin SR (slow-release) in 1996 (it also may have been prompted by the fact that the patent on Wellbutrin was running out?). Anyway, important to this discussion is that Wellbutrin SR is available in 3 strengths: 100mg, 150mg and 200mg. Note that there is an overlap here. Both the immediate release and the SR (slow release) come in a 100mg tablet. But the immediate release is always dosed 3-4 times daily, and the SR (slow release) is dosed twice daily. 3. Wellbutrin XL (bupropion XL): Since even twice daily isn’t perfect, a once-daily formulation was approved in 2003 known as Wellbutrin XL. This version of Wellbutrin comes in 150mg and 300mg strengths. Note: There is another overlap here. Wellbutrin SR and XL both come in a 150mg strength, but the SR version must be dosed twice daily and the XL version is dosed once daily. 4. Zyban (bupropion SR): In 1997 a brand new indication for bupropion was approved: smoking cessation. The product that was approved for marketing for this purpose was called Zyban. The dosing for Zyban is exactly the same as for Wellbutrin SR (slow-release), which is twice daily. Unlike Wellbutrin SR though, Zyban is only available in 150mg strengths and was indicated to be used for just 7-12 weeks of treatment. THE CONFUSION: If all we had were brand-name products, it would be pretty simple to distinguish between the above 4 brands. However, all 4 are now available generically. The key to distinguishing between them is to look carefully at how the prescription is written and to look carefully at the labeling on the prescription stock bottles. 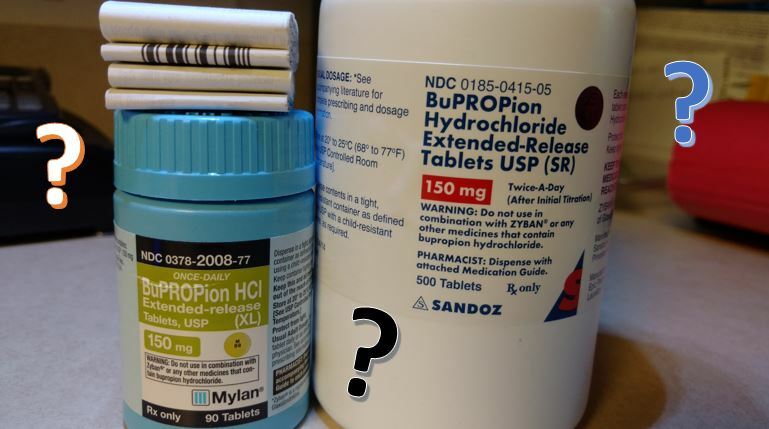 The easiest way to clear the confusion is to point out that your BUPROPION section on your shelves should have up to 8 spots for bupropion right now (one spot for each strength of each version). If your state sticks with strict Orange Book generic substitution rules, then you will have up to 8, as not all generics approved as equivalent to Zyban are necessarily approved as equivalent to Wellbutrin SR (even though both are dosed twice daily). 1) Bupropion 75mg (the immediate release version of Wellbutrin 75mg). Dosed 3-4 times daily. 2) Bupropion 100mg (the immediate release version of Wellbutrin 100mg). Dosed 3-4 times daily. 3) Bupropion 100mg SR (the generic of Wellbutrin SR 100mg). Dosed twice daily. 4) Bupropion 150mg SR (the generic of Wellbutrin SR 150mg). Dosed twice daily. 5) Bupropion 150mg SR (the generic of Zyban). Dosed twice daily. NOTE: Depending on your state substitution laws, you may be able to substitute #4 above (generic Wellbutrin SR 150mg) for a prescription written for Zyban since both are therapeutically equivalent. 6) Bupropion 200mg SR (the generic of Wellbutrin SR 200mg). Dosed twice daily. 7) Bupropion 150mg XL (the generic of Wellbutrin XL 150mg). Dosed once daily. 8) Bupropion 300mg XL (the generic of Wellbutrin XL 300mg). Dosed once daily. If the prescription is written as the brand name (always helpful) then the choice of the generic should be easy. A good software system will automatically switch the brand (when allowed) to the appropriate generic for you. Note that many generics are also helping by indicating “once daily” or “twice” daily on the bottles, to help distinguish between the XL and SR versions. If the prescription is written generically, then hopefully the prescriber used “SR” or “XL” to help identify which generic version is being requested. IF the prescription indicates to dispense the XL (once daily) version, but is dosed TWICE daily, this will almost definitely require a phone call to the MD office to clarify. This would be unusual and is probably a mistake. 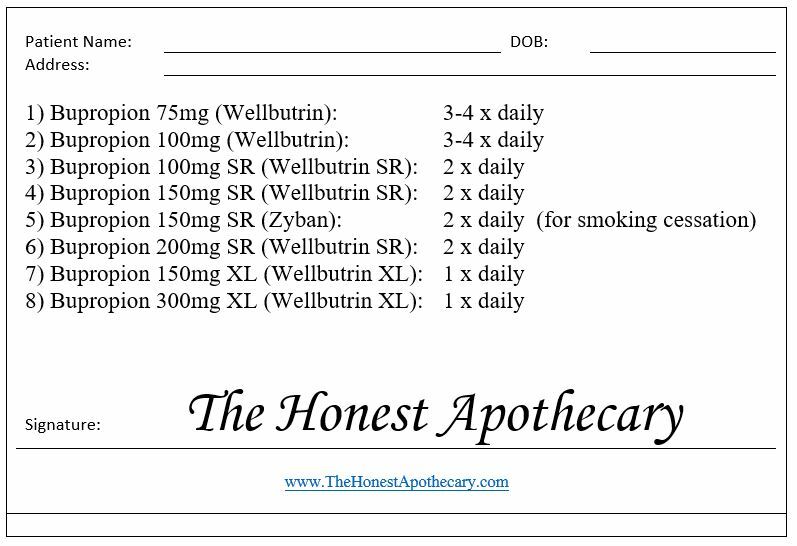 IF the prescription indicates to dispense the SR (twice daily) version, but is written to take it ONCE daily, this may also merit a phone call, although be aware that there are times when such dosing is appropriate. Always check the patient history when dispensing bupropion to see if the newest prescription might accidentally have been written for a different version than the patient has been on. This might merit a phone call as well. NOTE: The fact that the generic says “Extended Release” does NOT necessarily indicate it is the XL (once daily) version. Read the label carefully and look for the words “once daily” or “twice daily” to determine if it is the equivalent to Wellbutrin SR or XL. Wellbutrin SR (bupropion SR) which is ordinarily dosed twice daily is usually STARTED by dosing once daily for about 3 days before increasing to twice daily doses. Wellbutrin SR (bupropion SR) which is ordinarily dosed twice daily might be dosed once daily or even every other day in the case of significantly diminished liver function. There are a couple brand name bupropion products on the market that have not yet had generics approved. They are Forfivo XL (bupropion) and Aplenzin (bupropion). Thankfully they both come in unique strengths that will not overlap with currently available generics. » Prescription Drugs » Confused by Bupropion Strengths? Patient Question: Adderall, Wellbutrin & Viibryd safe?